Chozo-shaped apartment integrated in the Biosphere Reserve. An authentic natural experience. The Hotel Los Chozos has been offering since 1995 a unique rural accommodation, as it has a Chozo Perfectly integrated into the natural environment, in the heart of the Natural Park of Sierra de Grazalema. This has been achieved thanks to bioclimatic architectural designs and low environmental impact. From the outside, the Chozo looks like a simple shepherd's hut integrated into the Sierra, evoking the homes of our ancestors centuries ago. 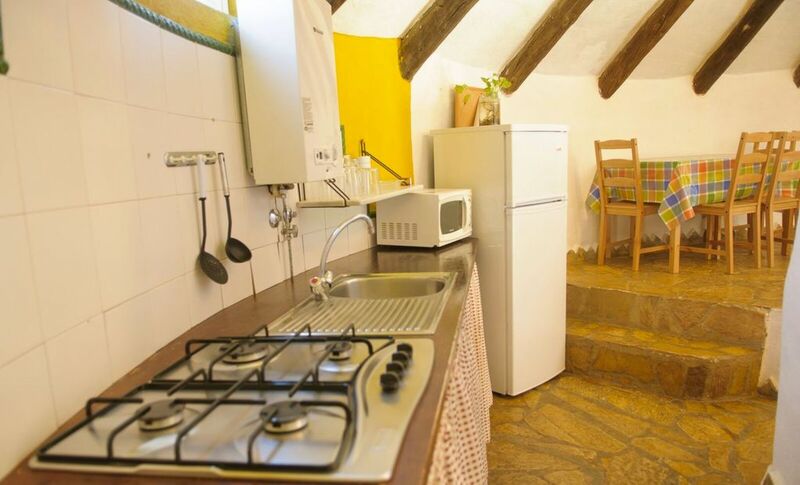 But inside, the Chozo has 110 m2 built, with all the comforts of a current accommodation, with kitchen equipped with utensils and appliances, living room and living area with fireplace, 2 bedrooms and 2 bathrooms. The Hotel Los Chozos is located on a plot of 68,000 m2 in the Natural Park, and has a maximum capacity of 10 places. It has a general pavilion of 1. 240 m2, where the reception, the living room, lounge, kitchens, restaurant, services, other auxiliary units and the hostel are located. In addition, it has a swimming pool for our customers, parking, garden areas, WIFI Zone and a unique natural enclave. Therefore, the Hotel Los Chozos, besides being a unique holiday resort to relax and enjoy nature, is the ideal place for weddings, business activities, school trips and summer camps.